What some consider Ezra Vogel’s crowning achievement, Deng Xiaoping and the Transformation of China (DXTC), is more a political history of China’s opening and reform under Deng’s leadership than a biography. As a history of China’s transformation, Vogel’s account focuses on Deng’s involvement in the power struggle over which agenda would emanate from Beijing. As a biography, Deng’s personality is oddly absent, ceding to an almost existential interpretation whereby the essence and sum of Deng is what he did, not who he was. Most importantly, Vogel chooses not to address the more damning aspects of Deng’s career, which leaves the definitive work on Deng to future scholarship. DXTC, however, may become the standard work on the party politics the drove the reform era. Vogel dedicates little ink to Deng’s time as a Communist revolutionary and rushes through 1904-69 in just 34 pages. The narrative begins to slow once the Cultural Revolution unfolds and Deng is exiled to the political wilderness where he will soon emerge with a sure-footed agenda to transform China. The heart of DXTC arguably lies in the years 1977-79, which recounts in fascinating detail the return of Deng to Chinese politics Hua Guofeng’s transition out of power. This is Vogel at his best. The behind-the-scenes politicking is well-documented and our author demonstrates keen insight into motivations and the shifting intra-party alliances. While this power struggle period occupies a significant portion of the book, the actual reforms of the 1980s that span a decade are given only equal amount of space. Vogel may be implicitly contending that the key to understanding China’s transformation lies in Deng’s rise to the top signalling the death of Maoism. This power struggle pit Hua Guofeng’s “two whatevers” line against Deng’s “seeking truth from facts”. Either follow “whatever” Mao said or declaring as “true” whatever works on the ground. The latter’s victory over the former placed China on a trajectory toward stable growth economically. Politically, Deng was a firm believer in the necessity of the Communist Party to China’s integrity and rise, but the form its rulership took was a sharp break from the Mao era. Deng eschewed politics of the masses and the revolutionary fervor whipped up by Mao. Those Deng promoted to the upper echelons of the Party–cadres who suffered during the Cultural Revolution–had a natural inclination against Maoist politics. Deng’s reforms did not go unchallenged. His alter ego, Chen Yun, was a cadre par excellence of almost equal stature as Deng. While Deng had his foot on the acceleration pedal to speed up market reforms, Chen Yun’s foot pressed lightly on the breaks fearing inflation and an overheated economy. A slow-accelerate-slow-accelerate pattern characterized the 1980s as Deng and Yun played the give-and-take game. Chen’s readjustment policy from 1980-81 positioned the economy to handle Deng’s subsequent reforms. Again, Chen retrenched in 1985-86 followed by another burst of reform. This culminated in the disastrous policy to remove price controls in 1988, which resulted in skyrocketing inflation. The turn of events forced Deng again to backtrack, only to come back again in 1992 with his famous Southern Journey of the Special Economic Zones begun under Hua, but ultimately bearing fruit under Deng’s hand. As mentioned above, Vogel’s treatment of the economic reforms falls short of an economic history in terms of depth. Vogel’s focus is party politics of reform. Vogel organizes his chapters as a hybrid of themes and chronology. While each chapter does move readers forward in history, the timeframe covered in several chapters overlap, but each chapter devoted to a different topic. This is at times disorienting. For example, Vogel makes asides about Deng’s decision to send troops into Vietnam over the course of several chapters, but he does not cover the 1979 Vietnam invasion until later. After 1988, Vogel’s narrative becomes linear as the leadup to the 1989 Tiananmen tragedy and the incident itself spans two chapters, followed by Deng’s last major high point with the Southern Journey. Vogel’s evaluation of Deng’s career as paramount leader is decisively positive. Some may even say DXTC bears the characteristics of an authorized biography in the way the book’s limited scope allows Vogel to elide or devote little attention to darker segments of the Deng story. Vogel rushes through Deng’s formation period as a young adult and consistently portrays Deng as a leader that Western readers would approve of. This approving portrayal marks Deng’s revolutionary activities in Tibet, his complicity in the Great Leap Forward, his execution of the Anti-Rightist Campaign (1957-58), and other major pre-1969 initiatives that might cast poor light on the protagonist of DXTC. Vogel plods more heavily through the post-1969 years, but still treads softly on Deng’s blemishes. Deng’s military incursion into Vietnam is painted with more upbeat colors than most history accounts, concluding with Lee Kuan Yew’s stamp of approval. The Tiananmen tragedy is acknowledged as a tragedy, but potentially a necessary one to keep China intact and stable. With this in mind, readers may be helped to approach DXTC as a focused book on a specific topic—China’s awe-inspiring transformation after the demise of Maoism and the role of Deng in this rebirth. Unfortunately, Vogel does not set these parameters up front and for that he makes himself vulnerable to exaggerated accusations of fawning over Deng. This does not excuse Vogel’s decisions to portray Deng’s shortcomings as he does, but should temper the overly critical reader. Biographically, Vogel fails to give readers a real sense of Deng the man and chooses to dedicate his writing to Deng the party-man. Vogel’s Deng is a political creature. The most systematic treatment of Deng’s personality is primarily in the context of his policies and his policymaking practices. Despite these shortfalls, DXTC should still be required reading for the serious China scholar. Vogel remains a revered fixture in China studies and for good reason. This book is a formidable foray into the details of party politics that transformed the Chinese economy. Vogel believes Deng is one of the most important leaders of the twentieth century; and while he succeeds in convincingly arguing his case, other biographies and histories are needed to provide a more balanced picture. 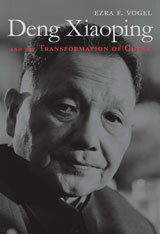 The definitive work on Deng is still to come, but Vogel has lodged an important piece in place.